Mitt Romney is the de facto Republican nominee until he manages to blow it in Wisconsin or something. He’s finally experiencing another run of endorsements, from Republicans of stature (or, in Marco Rubio’s case, duende) who were staying out of this until the water looked safe. These endorsements have something in common: They are not particularly enthusiastic. They are Mitthusiastic. They salute Romney as someone who has won a bunch of votes and is better than Barack Obama. That’s high praise! Now, here’s Jeb Bush on Romney. It is time to get behind the nominee, and it is time for the country to focus on the most important thing, which is to elect a president who will create a climate for high growth and job-creating abilities for our country… He knows the proper role of government in education, which is limited. Follow that with Marco Rubio’s confession on last night’s episode of Hannity. RUBIO: I think it’s evidently and increasingly clear that Mitt Romney is going to be the Republican nominee. HANNITY: Well, up to this point, you had not jumped into the primary race. Are you endorsing Mitt Romney then? RUBIO: Well, I am going to endorse Mitt Romney and the reason why, it’s not only because he’s going to be the Republican nominee but he offers at this point, such a stark contrast to the President’s record. I mean, look at the President’s record. This is someone who has run the country, not very well over the last three years but has no experience beyond that, doing that. At the same time, he has no experience with the private sector or the free enterprise system. In Mitt Romney, we have a candidate, an alternative, that in addition to being successful as a governor running an important state in this country, has also been successful in the private sector and offers a very clear alternative to the direction this President is going to take our country. It’s not only because he’s going to be the Republican nominee! 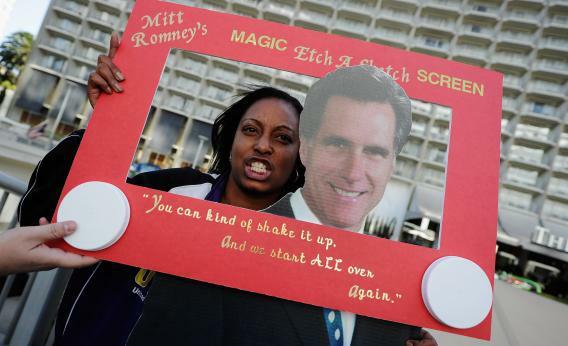 Real Romney fans exist, but the median Romney endorser is someone who can settle. If you notice more political leaders endorsing Mitt Romney with words that are definitely English, but not thrilled, flag me.